In the last few years, the demand for process analyzers has scaled higher, thanks to their rising use across diverse industries. A process analyzer, coupled with other embedded advance electronic components, provides a cost-effective handling process, which is the foremost factor coercing manufacturers to invest in them. High speed analysis and cost effecting handling process offered by process analyzers have increased their use in the processing of volatile organization components. Besides this, the market is gaining from the rising demand for chemical proceslyzers have esing equipment witnessed worldwide. As a result of the recent technological advancements, manufacturers could innovate novel product with better design and performance. Furthermore, these advanced models were more cost-effective. Considering such upgrades, the demand for process analyzers has considerably increased in the water and wastewater treatment market. Moreover, governments around the world are looking to provide clean water to their citizens thus providing an environment conducive to the growth of the global process analyzer market. While high cost of installation and maintenance will create bottlenecks, the market will gain from the rising opportunities in Asia Pacific. Between 2016 and 2024, the process analyzer market is forecast to exhibit a CAGR of 9.1%. At this pace, the market will reach US$11.501 bn by the end of 2024, from US$5.29 bn in 2015. In terms of form factor, the global process analyzer market can be segmented into portable, standard, and rack mount. Of these, the standard process analyzers constituted the leading segment, trailed by rack mount process analyzers. The rising demand for organic materials to curb production expenses has had a positive impact on the process analyzer market. Polymers and papers are among the most commonly used organic materials in the process. The demand for portable process analyzers is expected to increase due to their low maintenance cost and easy operation facilities. By end-use industry, the global process analyzer market can be segmented into chemical, oil and gas, pharmaceutical, power generation and transmission, food and beverage, and mining. Of these, the oil and gas segment held the dominant share of 54% in the market in 2015. The process analyzer technology is used in different verticals such as mineral or liquid separation, adding ingredients, and temperature control among others. In the coming years the market is expected to witness rising demand from the food and beverage industry. In the food processing industry, analyzers are extensively used to measure raw ingredients and the physical and chemical nature of food. In the coming years, the demand for process analyzers is forecast to increase further in the food and beverage industry. Regionally, the global process analyzer market can be segmented into Europe, North America, Asia Pacific, Latin America, and the Middle East and Africa. Asia Pacific held the dominant share of 40.8% in the overall market in 2015 and is forecast to remain at the fore through the forecast period. While North America and Europe will remain lucrative pockets, saturation in the developed countries will coerce manufacturers to shift focus towards the leading economies of Asia pacific. For instance, in countries such as India, China, and Japan, the process analyzer market will witness lucrative scope for expansion. Besides these nations, the demand for process analyzers will remain high in France, Germany, the UAE, and the US. t through the forecast period. verage industry. Some of the most prominent players operating in the process analyzer market are ABB Ltd. (Switzerland), Siemens AG (Germany), Modcon Systems Ltd. (The U.K), Applied Analytics, Inc.(The U.S), Endress+Hauser Management AG (Switzerland), Applied Instrument Technologies, Inc.( The U.S), Emerson Electric Co.(The U.S), SICK AG ( Germany), INFICON, Inc.(Switzerland), AMETEK, Inc. (The U.S) andYokogawa Electric Corporation (Japan) among others. Increasing demand of technological advancement and growing application of process analyzer in the oil and gas, chemical, power generation and transmission sector is expected to have an encouraging influence on the market for process analyzer globally.Increasing usage of volatile organic components for different food products is having a positive influence on the process analyzer market. Usages of process analyzers coupled with well-established techniques and methods are some of the enhancing factors for the process analyzer market. The growing usage of different types of instruments both software and hardware in the production of process analyzer is expected to have a positive impact on the process analyzer market. In addition, continuous demand by the end users for maintenance, replacement services and regular support to confirm the operative performance of the analyzer equipment are the other important factor that are expected to generate the growth of process analyzers market. However, pharmaceutical sector across the globe, especially in developing countries such as India and China among others across the Asia Pacific is one of the most important factor anticipated to trigger the demand of different categories of process analyzer in the coming years. Based on form factor, the process analyzer market is segmented into standard, portable and rackmount. In addition, demand for standard analyzer in processing plants is estimated to rise in developed countries during the forecast period owing to increasing demand for chemical sources in order to keep pace with the rising demand of chemical related product line. Based on end use industry, the market is segmented into oil and gas, chemical, power genaration and transmission, pharmaceutical, mining, food and beverages and others.In oil and gas industry process analyzer technology is used in different industry verticals which include mineral or liquid separation, adding ingredient and temperature control of mixture among others which in turn has increased the usage of process analyzer application in coming years. Geographically, the global process analyzer market has been bifurcated into North America, Europe, Asia Pacific, Middle East and Africa, Latin America. The process analyzer market has been provided in (USD million) in terms of revenue as well as the CAGR for the forecast period of 2016 to 2024. The report also provides assessment of different drivers that is impacting the global market, along with the restraints and opportunities that has also been covered under the scope of this report. For each segment (such as form factor, end use industry), market dynamics analysis has been provided. All these factors helps in determining different trends that has been impacting the overall market growth. 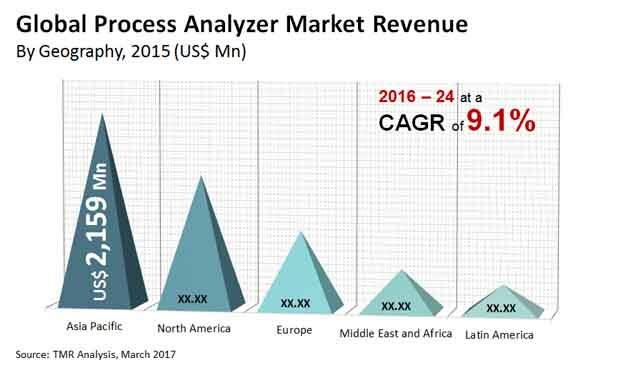 Moreover, after taking into consideration all this factors, an extensive analysis of the region wise growth parameters of process analyzer market along with the overall assessment for the forecast period of 2016-2024 has been also been provided within this report. Furthermore, the report includes the porter’s five forces and value chain analysis. Moreover, patents analysis is also included in the scope of the research. Major share and competitive landscape of major companies has been covered in the scope our report. The key players in the process analyzer market have been competitively profiled across the five broad geographic regions. This competitive landscape is inclusive of the various business strategies adopted by these major players and their recent developments in the field of process analyzer market. Further, the report includes the market attractiveness analysis of different form factors of process analyzer market and insight into the major end use industry area of the process analyzer. Moreover, some of the important players operating in the process analyzer market are ABB Ltd. (Switzerland), Siemens AG (Germany), Modcon Systems Ltd. (The U.K), Applied Analytics, Inc.(The U.S), Endress+Hauser Management AG (Switzerland), Applied Instrument Technologies, Inc.( The U.S), Emerson Electric Co.(The U.S), SICK AG ( Germany), INFICON, Inc.(Switzerland), AMETEK, Inc. (The U.S) and Yokogawa Electric Corporation (Japan) among others.